Miss Bates is content to return to her neglected TBR Challenge! Check it out chez Wendy here. This month’s theme was to read a nominated, or winning Rita title. Because Miss Bates is pathetically slumping along to Ros’s Summer Big Fat Book read-a-long, she chose a category romance. They’re short and she’s already behind the BFB, and summer reading piles litter her apartment and slow down two e-readers. (Way too much time on Twitter for Miss B.; also lolling, gazing at sunbeams, and sleeping in. It’s a feline life.) Reading Rita winners was one way Miss Bates segued into romance: their annual nominated and winning title lists provided tried and true romance reading as Miss B. figured out what she liked and didn’t in the genre. (Shudder PNR.) It was with nostalgia for her early romance reading days that she looked at titles she’d added to the TBR from these romance reading baby steps. 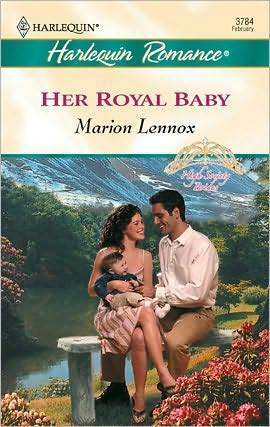 Marion Lennox’s Her Royal Baby won the 2004 Best Traditional Romance. Woot! thought Miss B., category, baby, Rita winner, and an author that she’s wanted to read for ages thanks to some nifty reviews over at Dear Author lauding Lennox’s more recent category novels. The whole royalty thing is not to Miss B.’s taste, no blood is blue she says, but she liked the cover. Miss Bates doesn’t regret her choice, but boy oh boy, was this ever a flawed and floundering effort. Lennox’s Her Royal Baby sets up a solid conflict, as long as the reader accepts the premise that Europe contains countless picturesque principalities. Prince Regent Marc, of Broitenburg, travels to Australia to ask Tamsin, “Tammy,” Dexter, tree surgeon, to release her nephew, Henry, heir to the Broitenburg throne, to his care. Except for one tinsy-winsy problem: Tammy didn’t know her nephew existed until Marc appeared. She’s estranged from her bad, fortune-seeking mother and flighty society girl, also fortune-seeking sister, Lara. She didn’t know that Lara died in a skiing accident with Jean-Paul, her husband and then Prince of Broitenburg, Marc’s cousin. Tamsin is good, honest, and poor, a women who saves trees, a woman hated by her evil mother and ignored by her beautiful sister. Baby Henry needs her soft heart and loving ways because the ten-month-old royal infant has been ignored beyond his basic daily feeding and hygiene needs. He is a desultory baby because he’s never been loved, cuddled, or spoken to. Tamsin is a lonely woman who needs to love badly. She won’t hand Henry to Marc to be raised in cold-hearted luxury by competent, emotionally-void nannies. Marc, in turn, doesn’t want the throne: he wants to leave a stable, democratic country to Henry, but to lead his own life. He’d never been a part of the castle scene, or Jean-Paul and Lara’s dissipation. Baby Henry is Marc and Tammy’s battleground: she pulling for love and cuddles and privacy; he pulling to Broitenburg and caring for Henry with the idea that he’ll take over the title when he comes of age. Marc convinces Tammy to compromise by moving to Broitenburg, with Henry, where they continue to squabble over his upbringing and are swept up in an uncontrollable fierce passion for … each other. Romance narrative has a sister-soul in melodrama: exaggerated protagonists and antagonists and centred on evoking and portraying emotion. It differs, of course, by its domestic setting. Even romantic suspense, or thriller-type romance narratives ease into domestic dénouement. But melodrama, like revenge, is a dish best served cold. It dwells in sentimentality: as feeling prevailing over sense. What better example than the category obsession with wealth and royalty? Those cold social constructs of power and privilege (not sure that’s what they are, but nevertheless, MissB’ll go with it for her argument’s sake) mitigated, humanized, and domesticated by feeling: in traditional romance (as Her Royal Baby was designated by RWA), the humanizing influence is brought to bear on wealth and privilege by heroine and children. Moppets are not everyone’s cuppa, but their presence makes sense in romance narrative. The skilled and inspired romance writer wields melodrama/sentimentality with a fine and knowing hand. Throw in irony and wit and the result is pretty nifty; witness Chase’s Lord of Scoundrels. Sadly, in Miss Bates’ estimation, Lennox did not do so. Her emotional pitch is set so high, the reader is beset by notes too strident and out of control for enjoyment. There are reasons: the protagonists’ back-stories and hysteria of their physical contact (not too much, folks, just burning kisses) thoroughly internalized and weak in light of the dearth of “quality” time they spend together as a couple. “She learned early that solitude was the only solution to pain,” we learn of Tamsin. Tamsin has a horrifically evil, negligent mother and subsequent bad bad childhood, now dead, formerly drug-addicted sister, and emotionally catatonic nephew. Her magic touch returns him to emotional life. She learns that her brother-in-law was a drug addict and his friends tried to feed drugs to Baby Henry as well. Gasp. Topping off the nastiness, Baby Henry’s nannies have been emotionally-stunted automatons. Things don’t get any better for studly Marc: his father had an affair with Jean-Paul’s mother. Devastated, his good, loving mother committed suicide when Marc was twelve; subsequently, his father drank himself to death. Jean-Paul ran a corrupt régime and near bankrupted Broitenburg. By which point, Miss B. was squirming. Maybe these back-stories established motivation for actions taken, or not taken, in the romance? Except … um … there wasn’t much romance. Tamsin and Marc squabble over Henry for the duration. Except when they kiss. And Tammy? [She doesn’t surge, but she does merge with nifty Bardic quotation.] Like Marc she was powerless to stop even if she’d wanted to … What had Shakespeare said? ‘A consummation devoutly to be wished.’ A consummation. That was what this was, she thought dazedly. A consummation … She was merging into him right now – changing – learning that there was a whole sweet world that had been locked to her until now. But for now there was only him. The feel of him. The wonder. The aching need. So her lips welcomed him, her hands clung and she felt her body light with fire. He was her man. For this sweet time – for this minute, maybe, if that was all there was – he was her home. Miss Bates was exhausted. A breakdown of language and writer not in control of her material. She understands what Lennox was attempting. D. H. Lawrence said, not sure where but in reference to Lady Chatterley’s Lover?, that what he was trying to convey in language was that which is beyond language: union with the other. Romance writing often tries to do the same. Sometimes, it succeeds (read Cecilia Grant’s A Lady Awakened right now); sometimes, it doesn’t, as in Lennox’s case. In Miss B’s estimation, the reason isn’t complicated: it has to be accompanied by a whole lot of other stuff, the most important being, communication. It can be silent and smoldery; it can be banter-ish. It can take the form of dialogue, or gesture. But it has to be there and it has to be there A LOT. Even Mellors and Constance communicate before they consum/mate. Marc and Tammy bicker and spend an awful lot of time in their heads (sadly, we do too), but they don’t communicate. They don’t understand where each stands, and comes from. They don’t connect, except for Soulful Canoodles. Lennox’s Her Royal Baby is not pernicious; it shows promise. Said promise, however, is evident at the beginning and end, the middle pretty much what you’ve read above. Her Royal Baby uses a great framing device. When the novel opens, Tammy’s up a tree in the Australian outback. Marc arrives in full princely regalia to convince her to give up Henry. It’s a great scene: gently humorous, again with plenty of room for head-space ruminations, but charming and fun. The final scene has Tammy up another tree in Australia. Marc’s back too: this time to tell her how much he loves her and propose marriage. It’s a great scene: head-space ruminations at a minimum, pretty cool avowals, great use of “falling for you” metaphor as Marc precariously makes his way up the tree … if only the middle bits had been as good. Marion Lennox’s Her Royal Baby didn’t live up to its Rita-winning promise, though Miss Bates would give Lennox another try. This “royal baby” had a “high claim to forbearance,” Emma. Miss Bates bought Her Royal Baby out of her spinster’s savings. Published by Harlequin, it’s available in “e” only, at the usual vendors. What have you read, dear reader, that you went into with “high hopes” only to have them dashed? Alternately, Miss Bate is fascinated by the breakdown of language in romance, where the attempt to capture emotional or physical experience is out of the writer’s control. What instances have you encountered in your romance reading? After our brief Twitter convo last night I was looking forward to your review. This was great. I had to laugh at your comments in the quote! I’ve read 4 or 5 of Lennox’s more recent books and I think you would find that the promise she showed in your book is realized in her later books. It’s interesting, isn’t it, what wins a RITA. Thank you for your kind words! Miss Bates really did get a kick out of the narrative’s unraveling in those passages, but she can also recognize that Lennox, if she gained control over her material, could do much better. The issues/themes were interesting: what do children need to thrive? What does it mean to risk your heart? Their execution, however, not so good. As for the Rita, MissB. doesn’t always understand their choices and the process is pretty convoluted and fraught. Funnily enough, we were having a discussion on Twitter yesterday of favorite poems and poetry recitations, starting with Prufrock, wending our way through Neruda, and leading me eventually to a reread of Molly Bloom’s soliloquy from Ulysses. That piece, although clearly not suitable for a romance novel–no stream of consciousness romances, thank you–is a lovely example of the breakdown of language capturing a moment. It is also, at the moment, overriding every other memory I have of such things, but maybe I’ll come up with another example at some point! My worst case of high hopes turning to crushing disappointment was when I fell out of love with an author I had adored long, long ago. I’d been a faithful buyer of her books for years & reread her best stories regularly. Eventually, though, her contemporaries became rather political and scornful of anyone who didn’t follow a certain set of beliefs, and she published a historical where the hero flat-out raped the heroine. This being 25+ years after The Flame & The Flower, I was done with the author for good, which was quite a shame, as she’d written some terrific books in the past. I think I actually wrote her a letter at the time expressing my disappointment, which is a sign of how young I was (both by the use of snail mail and the wishful thinking that my disappointment might influence her!). Miss Bates is certain that your youthful books, like your youthful self, had the seeds of what you are now evident. So, they may not necessarily reflect what you can do now, but they’re still what got you here. She’d say this is true of Lennox too: there are potentialities there that could do good stuff and, evidently, they saw fruition, if the DA reviews are anything to go by. There are all kinds of things that are good about getting older (and several that Miss B. could do without), but the best, Miss Bates thinks, is a certain focus and precision, a certain single-mindedness, in what one believes, thinks, etc. and, at the same time, more forgiving and open. Miss B. remembers her youthful self as so much more rigid, in a way; as Nick Carraway says in The Great Gatsby, learning that the world will not bend to your will, or worldview, makes us want it to “stand at moral attention” even more so. But now Miss B. is rambling. She’s read Ulysses twice (both Homer’s and Joyce’s) and Molly’s monologue is her favourite part. Joyce’s novel always felt more cerebral than heart-centred, but Molly brings a unique and enlivening perspective to the narrative, a bodily, fleshy one, that her presence overwhelms the others. There is nothing worse and that will kill a writer’s work than an agenda, in this case, the one in the writer you’d loved so well. Didacticism is not a good or healthy thing in a writer, an ethical stance yes, but once you get an “ism” not good, even if it’s one a reader may be sympathetic to. Miss B. also thinks that it’s lovely that you took the time and care to write to her. She hopes she had the good manners to at least respond. I have really liked most of the Lennox books I’ve read, and Dating the Millionaire Doctor (I know, the title) is one of my favorite category romances. I should reread it and see if it holds up. But wow. This, no thanks. I pretty much avoid any Harlequins with “Baby” in the title (though there’ve been good ones) and any fake kingdoms. If you want to try Lennox again–and I think you’d like her good books–another good one is Christmas with her Boss. Miss Bates trotted off to her e-reader and … yes! … she has both those titles in her TBR, so she’s especially looking forward to them. She also has the Banksia Bay titles that Dear Author recommend so heartily. Miss Bates knows … wow! The prose was so over-wrought and very much “sound and fury,” but she could still see the promise in Lennox. Glad to hear yet another positive opinion because she really really wanted to like this book. She doesn’t mind the “baby” word, just generally avoids certain sub-genres, like PNR. Otherwise, anything’s a go, but she does have antipathy for royalty content. I’ve had “high hopes dashed” before, but the most recent one that sticks out is probably Eyes of Silver, Eyes of Gold by Ellen O’Connell – a self-published historical western romance that I was told was the greatest thing since sliced bread. And while Miss SuperWendy concedes that the story was very good, she found the writing…..not very good. Hug your editors tightly dear authors. I have a hard time with fake royalty books. I “get” why they are popular (hello, fairy tale), but I always have to go into them with a certain mind-set. They’re the sorts of books I probably would have devoured and loved as a teen, had I been reading romance back then – so I always try to drag Awkward Teenage Wendy out from the corner when I manage to get roped into reading one. “High hopes, we’ve got high hopes …” Miss Bates can just hear the lilting of that Sinatra song and it is the romance reader’s siren song. With every rec, every cover, ever title that falls in our lap. Let this be The One, another Keeper on the shelf. And we’re also creatures of our propensities, like Miss B’s for example, which is any and all marriage of convenience; or, thanks to you, the Western-set romance. She’s disappointed to hear that about Eyes of Silver, Eyes of Gold because she has it too in the TBR, at Kristiej’s recommendation, a review blogger much missed.